Congratulations, Dan! Hope you find a publisher for that manuscript. 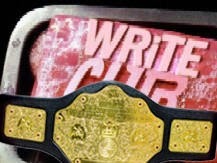 Congratulations to all of the writers brave enough to tackle Write Club this year. CONGRATS to the winner of Write Club! Thanks, DL, for an entertaining contest that spanned the genres and had me hopping to keep up. And, congrats to Lord Codpiece, AKA Dan, and Cocktail Lion, AKA AJ! Way to go! Congratulations, Dan and AJ. It was fun! Lord Codpiece tips his hat to a worthy opponent in Cocktail Lion. Well done! And my MC, Conley, runs a hand through his messy hair in acknowledgment. Thank you, sir, and great work! Congrats to Dan and AJ. Great job both of you and well deserved. I love Write Club! Congrats to Dan and AJ! I want to apologize for being absent throughout so much of the voting...life got crazier than usual this year! Congratulations, Dan & AJ! Nice battle. Congratulations, both of you! It was a tough contest. Congratulations to everyone who entered, and to Dan and AJ for making it to the final round. I enjoyed reading all the pieces! Much congratulations. A well deserved win. I tip my hat to you. Congratulations to Dan for the win! Your work was excellent and I definitely enjoyed it. And also, as one runner-up to another, "Congratulations!" also to AJ for a hard-fought competition! I wish you both tremendous success with your writing! And -- "Thank You" once again to Don (and Kim!) for all the work and effort it takes to host this contest! For the fourth year now, I have thoroughly enjoyed WRiTE Club! Congrats to both of you!! And a BIG thanks to Don and Kim for putting this on every year! Congratulations Dan! And thanks so much DL and Kim for working so hard to put this on for us.